What is GNMIDFMT? 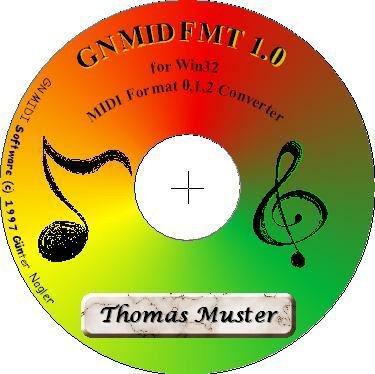 GNMIDFMT converts between MIDI formats 0, 1, 2 (MIDI type). The comfortable Windows software allows to convert several files at once. The software lists current MIDI file type of each file and simple click on button 1 2 or 3 converts single file or selected files. Shareware This software is not free, you can try the demo for 5 days to find out if the software does what you need. After trial period is over you have to decide between registering or deleting GNMIDFMT installation folder and demo. Even if you need it seldom you must register if you want to use it further. The demo is not intended for work, it demonstrates the capabilities of GNMIDFMT. GNMIDFMT installation The GNMIDFMT software is zip compressed. Unzip gnmidfmt.zip into a new folder on your harddisk (e.g. c:\GNMIDFMT). Newer Windows systems can show the zip file content as a Windows folder and can extract into a new folder. Other systems need install unzip software (Winzip, PKZip) before GNMIDFMT can be installed. Start gnmidfmt.exe with MS Explorer. Demo will start with a demo reminder, full version does not show the reminder. Registration price Single user license for GNMIDFMT costs 10 Euro (at company shareit.de). Anonymous purchase is not possible, users personal data (name, address, email) is used to create license. Full version is delivered postal way to users address. Software upgrade Registration of GNMIDFMT is valid for any version between 1.00 and 1.99 . Registered users can download newer demo in future and install it into their GNMIDFMT folder. How to register? You can order single user license at company Shareit.de. This is quickest method to register. You find some alternative but slower ways inside current GNMIDFMT demo (file readme.txt). How do I get my license? After successful order the newest software version and full registration key will be sent to your delivery address on CD-ROM (or if wanted on floppy disk). Soon after your successful registration at shareit.de we send a temporary license key to your email address if it is specified and valid. Full registration key will not be sent by email. Bonus If you order GNMIDI software now then GNMIDFMT software is included as bonus. In this case you receive a CD-ROM that contains GNMIDI with bonus GNMIDFMT. You don't need to order GNMIDFMT if you ordered GNMIDI first. System requirements GNMIDFMT runs only with Windows system. It was tested with Windows ME/2000/XP. It might run with other systems (95/98/NT) but we are not able to test on these systems. Before purchasing GNMIDFMT license please download current demo version and try it on your computer. Who should use GNMIDFMT? Many keyboards and MIDI modules only support to load format 0 MIDI files, but most MIDI files in network are in MIDI format 1. GNMIDFMT helps to convert those files quickly into format 0. People who are interested in GNMIDFMT should also look into GNMIDI demo, because GNMIDFMT is included in GNMIDI as bonus. It would be waste of money if you first register GNMIDFMT and later find out that you also need GNMIDI. Here are comments from GNMIDFMT users. Screenshot Click on small image to get a screenshot of GNMIDFMT.